In his debut novel "University" (ISBN 0988960400), John William Grisham takes readers on a spirited journey through college life during the big-hair decade. Vividly portraying the 1980s zeitgeist, University brings back an era fondly remembered, yet not far distant from our own time. Once an educational backwater, Metropolitan University has risen to the top tier of American colleges. But success has come at a price, its spirit crushed under the thumb of Fortin Shenford, Met's ambitious president, who effectively quashes all opposition on campus, his sights set on loftier peaks. Against this backdrop, the residents of Sterling Hall's fourth floor manage to form a lasting bond. A fraternal oasis in a student body known for apathy and disunion, Sterling 4 is populated with memorable characters: Mike "Wally" Hall, leader of the self-styled Mutants; Dwight, the wheelchair-bound video game wizard; Marcus, the sheltered, socially naive freshman; Brandon Clark, the blunt-spoken activist; Chug Allen, student-politician and rascal king; and tomboyish Rosemary, Marcus's unspoken crush. Over four years, enduring friendships are born, rules broken, and traditions established as they move from the trials of adolescence to the waiting responsibilities of adulthood. With its unique yet recognizable characters and eye for period detail, "University" provides readers with an intensely memorable experience. Whether you are a 1980's alumnus or a first-time visitor, this novel recaptures the essence of a watershed decade. 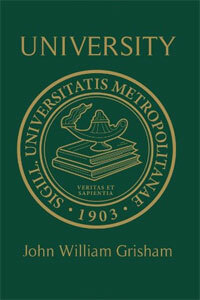 Aloha Lounge Press is the publisher of the independent novel University, by John William Grisham. University is available now at Amazon and other outlets.